While not to everybody’s taste, Begonias are nevertheless popular and colourful bedding plants that find their way into many window boxes, containers and hanging baskets each summer. They are also widely used in traditional public park summer bedding schemes. They are easy to look after and will provide continuous colour throughout the summer until the first frosts, even in semi-shade. There are thought to be some 900 species of begonia, distributed across the tropical and subtropical forests of South and Central America, Africa, and southern Asia. As such, they are not hardy in the UK, and can only be grown outdoors in the summer. Begonia flowers come in a wide range of intense reds, pinks, oranges and yellows, and also cooler white. The colour comes from the flower’s sepals rather than petals. Some types of Begonia also have attractive bronze or variegated foliage. The first western plant hunter to describe a Begonia was a Franciscan monk called Charles Plumier in Brazil in 1690. He named the plant after the botanist Michel Begon who was also Governor of Haiti. The first pants were brought to Europe in the mid 1800s. 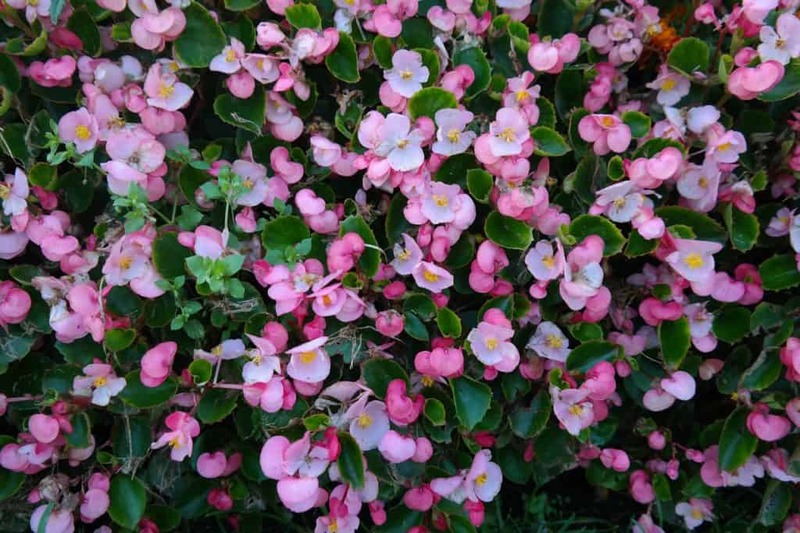 The familiar garden bedding Begonias are mostly bred from seven colourful species found in the Andes Mountains of Peru in the mid-19th century. They are generally listed under the name Begonia x tuberhybrida. Many other types of Begonia are grown in conservatories and as houseplants for their foliage rather than their flowers, but this article focuses mainly on the garden varieties that are grown as bedding and in containers, including the semperflorens group, or wax begonias. 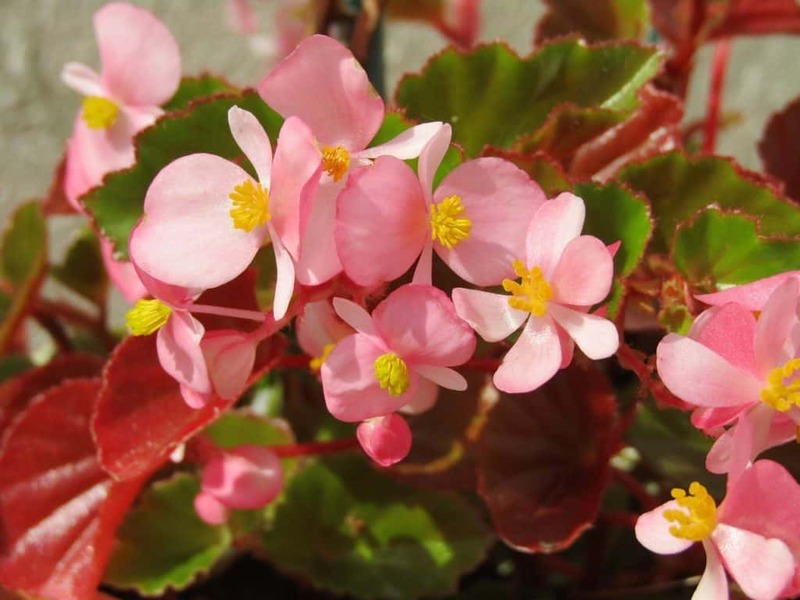 The labelling and description of the complex array of Begonia types is far from straightforward, especially when looking beyond the generic mixed collections available from garden centres and supermarkets. ‘Picotee’ refers to sepals with edges that contrast with the principal colour, but only if the colours are considered to blend: if they do not, then ‘marginata’ is used. ‘Fimbriata’ Begonias have fringed sepals, and ‘pendula’ varieties have a trailing growth form that is ideal for hanging baskets. ‘Irene Nuss’ is an evergreen perennial that grows up to 1.2m. It has erect stems and large leaves that are bronze-green above and reddish beneath. The pink flowers emerge in dramatic, pendulous, bell-shaped clusters. This cultivar is mainly grown for its variegated dark green leaves with brown veins and highlights. The tiny flower clusters are held above the leaves and are white with a light pink blush. It is clump forming and grows to 30cm tall. ‘Marmaduke’ forms a bushy plant up to 50cm tall, with oval yellowish-green leaves that are heavily blotched with reddish-brown, and sprays of small pale pink flowers in late spring. This Rex Begonia is very tender but can be put outside for the summer. It is evergreen and primarily grown for its handsome grey, deep purple-red and dark green variegated leaves, rather than the small pink flowers that sometimes appear in spring, summer or autumn. Another tender variety that does best at around 20ºC but which can be grown outside in containers through the warmer part of the summer, ‘Munchkin’ is a bushy perennial that grows up to 20cm in height. Its large, frilly, hairy, ovate leaves are bronze with green veining and red beneath. It produces large clusters of rather inconspicuous pink flowers. A good choice for hanging baskets and window boxes in shadier locations, ‘Orange Rubra’ grows to 75cm and has bright green foliage that provides a foil to the pendulous, vivid, bright orange flowers. It will not do well in continuous direct sunlight or in waterlogged conditions. This is another indoor plant that can be put outside for the summer. It has deeply frilled and lobed dark olive-green leaves with yellow veins and deeper markings, and red undersides. It produces small, delicate deep pink flowers. ‘Tiger Paws’ has rounded, lobed pale green leaves with darker, big-cat-like markings. It must be grown under glass for most of the year but can be put outside for the summer. In summer, it may produce small sprays of pale pink flowers as an added bonus. Other widely available varieties for the hanging baskets, containers and bedding include the following. These have a semi-trailing habit and are ideal for hanging baskets and the edges of large pots and containers. The series includes Begonia ‘Yadev’, which has pointed green leaves that are edged in pale pink and bright luscious red, pendulous flowers on pink stems. They grow up to 45cm, flower into October, and do not require routine deadheading. This series of cascading Begonias comes in a wide range of colours. They are perfect for summer hanging baskets. Amongst the more popular types is Begonia ‘Illumination Orange’, which produces masses of vibrant, dark orange, semi-double flowers on red stems. The leaves are hairy and mostly green but with orange margins. These are free-flowering semperflorens Begonias. In favourable conditions they can be persuaded to flower throughout the summer. Begonia ‘Ambassador Rose’ grows to 20cm and has glossy green, red-edged foliage and pink flowers with prominent yellow stamens. The ‘Non-stop’ Begonias are hybrids that have the potential to bloom throughout the year. In the garden, they form compact, 20cm, vigorous plant that flower continuously from June to October. Many colour varieties are available. Begonia ‘Non Stop White’ has shining white flowers up to 7cm in diameter and contrasting dark green foliage. As with others in the series it makes a great bedding plant and is ideal for pots, window boxes and other containers. This variety has large, tumbling double blooms in fruity shades of peach, orange and lemon from July to October. It thrives in semi shade and its trailing habit makes it ideal for hanging baskets and window boxes, where it will dangle to 40cm. ‘Destiny Pink’ is another good choice for hanging baskets. It has large, double pink flowers and a glossy dark brown foliage. This smaller-flowered and compact, 30cm tall Begonia has striking purple-bronze foliage and bright orange flowers. It will cascade quite happily around the edges of a hanging basket or container. This variety has large, frilly, dark red flowers that contrast beautifully with the long, dark-green leaves. It is suitable for containers and hanging baskets. This trailing Begonia produces spectacular 35cm cascades of pink to orange flowers that have a prominent yellow eye. It will generally flower from May through to September. ‘Santa Cruz’ produces cascading bronze stems with fiery red to dark orange flowers on bronze stems from June through to the first frost. It is another good hanging basket variety that does not require deadheading. This new variety of vigorous, cascading Begonia has a 30cm spread and produces showy, double flowers in shades of apricot, orange and dark yellow from early summer right through to the autumn. It is wonderful for hanging baskets, window boxes and containers. This tuberous Begonia is hardy down to 0°C and with care and protection it can be left in the garden year-round in the south of the UK. It has delicate pink flowers with a prominent yellow centre in autumn and liver-shaped tropical-looking leaves with strong veining. It grows to 50cm, and needs moist and semi-shaded conditions. In general, tuberous begonias are best suited to growing in containers and hanging baskets, and are bought as dormant tubers from January to the end of March, while fibrous-rooted begonias are used in summer bedding schemes and are available as seeds, garden-ready plugs and container grown plants. Dormant tubers will develop rapidly into flowering plants, provided large and healthy specimens are chosen. Substandard damaged or mouldy tubers should be rejected, including any that have sprouted spindly shoots. In March, the dormant tubers should be placed individually into 125cm pots half-filled with an equal mixture of John Innes No 1 compost and peat-free multipurpose compost. Press the tuber into the surface with the hollow side up so that the bottom half is covered and then water sufficiently to moisten the compost, and place the pots in a propagator at 18°C or in a warm and bright place such as a windowsill over a radiator. Growth buds will emerge within a few weeks. To make a robust and strong plant, once the young shoots reach 3cm, rub off all but the three strongest. As the three stems grow longer, gradually over a couple of weeks top up the pot with compost, a centimetre at a time until it is just below the top. Once the pot is full, water and feed frequently using a liquid tomato feed. To promote the most spectacular blooms, take off the smaller side buds that grow each side of the main flower. Once all danger of frost has passed, home grown tuberous plants and nursery-bought plants in pots or plugs can be hardened off and taken outside in a container or they can be transplanted 30cm apart into the border. Although generally treated as half-hardy annuals, Begonias are actually perennials, which means that it is possible to over-winter them, especially the tuberous varieties, though few gardeners take the trouble to do so. The tubers must be lifted well before the first frosts. Stop watering them a few weeks in advance, then lift and store the cleaned, dry tubers in barely moist sand in a frost-free shed, ideally at 7°C. The surface of the sand should be moistened occasionally to stop the tubers shrivelling. Most Begonias do best in light shade, though many types will tolerate some sunshine and some will continue to thrive in even shadier conditions. Begonias are thirsty plants, and during dry weather those in containers or baskets will need to be watered daily in the early morning or the evening. Even border-growing plants will benefit from frequent watering to keep the plants healthy and flowers coming. When watering, avoid wetting the foliage, and do not water in sunshine. In general, Begonias require a friable, rich and well-drained growing medium that is neither constantly wet nor allowed to dry out completely. Reduce the intensity and frequency of watering from the beginning of September. Begonias in containers and baskets need a weekly feed of a high potash liquid tomato food, and a regular application will also help promote free flowering in border plants. Feeding can cease in mid September. All Begonias enjoy moist conditions but need good drainage, so containers must have a good quality compost with plenty of grit, generously-sized drainage holes, and they should be raised on pot feet or similar supports to encourage the rapid drainage of surplus water. Use Begonias in hanging basket displays with trailing lobelia, pelargoniums, petunias and fuchsia. Bedding displays are generally based on a combination of different varieties of Begonia, but these can also be complemented with other bedding plants. The design possibilities are almost limitless, but traditionally they are based around Bellis, Impatiens, pelargoniums and lobelia. A more modern take on the theme is often given by including sub-tropical or tropical-looking plants as features, such as bananas, cannas, agave, cordylines, or Phormium. Begonias do not need routine pruning, but any wind-damaged stems can be removed and some varieties will flower longer into the autumn if regularly deadheaded. Most Begonias are easily propagated by division or from stem cuttings, though it is seldom considered worth home propagation of the typical bedding and basket Begonias. Specimen Rex Begonias can be propagated from leaf cuttings. Tuberous begonias can be increased by division. The tubers are started as normal, then when the shoots appear the tuber is cut into sections, each having at least one bud and some root. These need longer to develop into flowering plants and will need to be overwintered to reach their full potential. Stem cuttings at least 10cm long with a heel of tuber can be taken off a developing plant in April. This can be grown on in a sandy rooting compost with bottom heat at around 20°C. Semperflorens Begonia seeds can be bought and sown onto the surface of seed compost in February or March. Cover the tray or pot with plastic until germination occurs. They need to be kept moist at a temperature of 20°C to 25°C. When the seedlings produce their first true leaf, prick them into individual 7.5cm pots, then later into 13cm pots. Most Begonia problems tend to be related to physical conditions rather than pests or diseases. In overly wet conditions the tubers may rot, whereas even the shortest period of drought will most likely result in flower drop. Begonias prefer light shade, and foliage may scorch when exposed to the full sun. Begonia plants can occasionally suffer from caterpillars, mealybugs, mites, thrips, vine weevil or aphids. Tuberous begonias can suffer from powdery mildew, fungal leaf spots, or occasionally Phytophthora root rot. Q I bought a section of Begonias for my patio containers this year, and one or two have been particularly nice. Can I take them indoors for the winter as house plants? Fibrous-rooted Begonias such as ‘wax’, ‘angel’ or ‘dragon-winged’ varieties can be lifted from the container, pruned into a suitable shape and re-potted into a suitable container that can be taken indoors fro the winter. If you feed them with liquid houseplant fertiliser and keep them well watered they will make an attractive pot plant that can be propagated into new plants for your containers next spring. Keep them in the conservatory or on a bright windowsill, turning regularly, but not in direct sunlight, and avoid draughty spots near doors, windows or open fireplaces.